No wiring needed just fix on wall. Total stake height - 48cm. Changes colour when it goes dark. If you fail to comply with this obligation, we may have a right of action against you for compensation. View all categories. Emits light for 8 hours a night. Twilight Sensor. Pole & spike included. Solar Energy Powered. Solar panel : 0.88W, 17% etficiency. Solar panel life: more than 5 years. No need to dig up your garden to lay expensive mains cable. Protect function : Over charging, over discharging, over current, short circuit. Add style and enhance the beauty of your garden with our beautiful solar lights. The colour changing LED will transform your night into a flowing sea of colour. Each solar globe light is 57cm tall, including a 12cm round crackled glass globe on top.Lights have passed CE and water proof test and are fully water and rust proof. Pet memorial cross A beautiful colour changing memorial cross to commemorate the death of a pet Solar powered lights up & changes colour to produce an array of bright LED lights Size: 98cm high with both stakes/72cm high with one stake . Garden & Outdoor. Super bright white LED. Photo-cell sensor Turns light on/off at dusk/dawn automatically. Ideal for borders or pathways, includes a ground spike for quick and easy installation. We're rated 5/5 for service! Who needs a tropical vacation?. A GREAT GIFT: Get it for the lawn decorator with a quirky sense of humor. Outdoors & Garden. Health & Beauty. Solar Panel: 0.55 W 17% efficiency. 2 solar panel led spotlights. Sensor angle: 120°. Equipped with on/off button. Night sensor < 10Lux. Led quantity: 20. Led power: 0.2 W. Battery: 3, 7v 1200mAH. Retro bulb design. 360 degree technology - for an all round glow. theUK's leading water feature, garden and Christmas Lights specialist. Set of two, we will send a gold and silver light bulb. Ideal for garden parties and can easily be hung. Refillable Yellow Canister. Bamboo outdoor, party torch. Good for backyard, party, outdoor sports, camping. 4 Handcrafted all-natural bamboo torches with rich, dark stain. Pole is cut at an angle at the bottom for easy ground installation. Model: 111316968. Manufacturer Part Number: 111316968. Solar lights. LED solar spike. indoor lighting. Recessed lighting. Bushes, flowers and small trees can be accentuated so impressively. Safety lights. Office lighting. Industrial Lighting. Solar panel power 0,3 Watt. replaceable batteries when depleted. NO LED 6-sided Led. N° led 6 LED. Tipo di lampadina LED. Degree of protection IP68. Materials Die-cast aluminum and high strength polycarbonate. Solar panel power 0,3 Watt. replaceable batteries when depleted. NO LED 6-sided Led. Materials Die-cast aluminum and high strength polycarbonate. Tipo di lampadina LED. Colore dei LED luce bianco freddo 6000k. 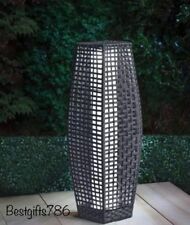 outdoor floor lamp Tellurium 1 MW-Light: Fashionable design at a reasonable price! "contemporary" style is capacious and luminaires, represented in contemporary style easily adapt to most of interior decisions - from elegant neo classic to ascetic loft. The fitting of this luminaire is represented in metal aluminium alloy outdoor floor lamp is equipped with tin-plated cupric wiring. Power capacity of this outdoor floor lamp is 60W Electric voltage of this Ceiling light is 230V. compatible with the U.K. electric systems, quick after-sales customer support; easy reclamation and return policy. All our products, selling on Ebay, have certificates of conformity (EU). . 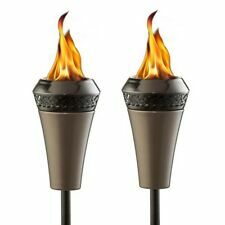 The Maui torch head can also be used as a tabletop tiki torch or can be mounted on the included sturdy 55" pole. Maui Tiki Torch bowl can be removed from cradle and used as a tabletop torch / lamp. Torches mount on included poles or on tabletop. Features Twist & Pour technology for easy filling. Torch head is removable for easy refill. Type: Patio Torch. Torch Fuel Not Included. Height: 66". Otherwise, we may cancel your order. The Kona torch head can also be used as a tabletop tiki torch or can be mounted on the included sturdy 55" pole. Torches mount on included poles or on tabletop. Pole Height: 55" (3-piece). Easy-open fill port for clean and safe refueling. Condition is New. Includes; torch head and 4 piece pole. Easy to assemble 4-piece pole. No tools required. Item model number: 1112149. Condition:Used (Very Good) - Open Box - Un-used, but the eye piece that is used to attach the cap to the torch is broken off of the cap. - Details: New, but the eye piece that is used to attach the cap to the torch is broken off of the cap. And the Twist and Pour Technology makes filling easy. Perfect for any outdoor occasion. Easy to use, easy to fill. Product Depth (in.). Product Width (in.). Product Height (in.). Application Type. And it's perfect for illuminating a favourite part of your garden or to mark driveways, patios and paths. It's effortless to assemble, too - simply slot the sections together to your desired height. 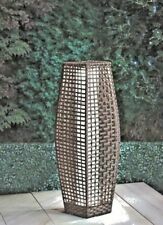 Traditional Sorrento Rattan Garden Floor Lamp Outdoor Solar Powered Effect 69cm. And the Twist and Pour Technology makes filling easy. We do our best to process as quickly as possible. If there's a problem, just let us know and we fix it. And the Twist and Pour Technology makes filling easy. Perfect for any outdoor occasion. Easy to use, easy to fill. Application Type. Its fresh, sleek curves and bold. And the Twist and Pour Technology. General Information. For Clean Burn Firepieces requiring Roundwick burner #6002383. Reusable RoundWick reduces hot spots and spillage. Type: Torch wick. Material: Fiberglass. Burns for up to 3 hours per 4-oz fill. (Orders are not able to be modified once order has been finalized and synced to our system. ). Don't let the buzz and bite of mosquitoes ruin the fun. bitefighter torch fuel in easy pour bottle. Stays lit in the wind. Twist and pour technology for easy filling. We stand behind our products. Type: Garden torch. Material: Steel. Color/Finish Family: Stainless steel. Citronella: No. Don't let the buzz and bite of mosquitoes ruin the fun. TIKI 66 in. BiteFighter Torch Fuel. bitefighter torch fuel in easy pour bottle. Twist and pour technology for easy filling. Stays lit in the wind. And the Twist and Pour Technology makes filling easy. Perfect for any outdoor occasion. Products are designed and rated for use in the US using 120 volt current. Bold, sleek design. The insulated RoundWick reduces the amount of heat that reaches the base's exterior. It burns efficiently for up to 3-hours on a single 3 oz. fuel fill. TIKI 7.5 in. Full-sized torch to a 50 in. mid-sized garden torch and 1 7.5 in. TIKI (2) 65 in. 2-convertible 2-in-1 torches: full-size torch 65 in. 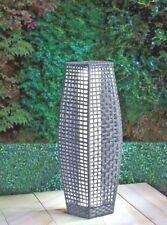 tall, garden torch 50 in. One 7.5 in. H clean burn fire piece. Easy to assemble 4-piece pole. No tools required. Item model number: 1112149. Learn More.